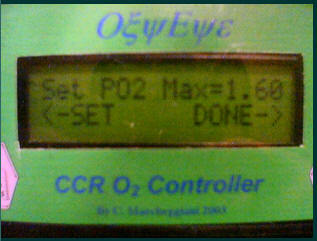 In fig.3 is shown the calibration menu that appear after the PPO2 limits setup. On the bottom row are shown the sensors voltages in millivolt. 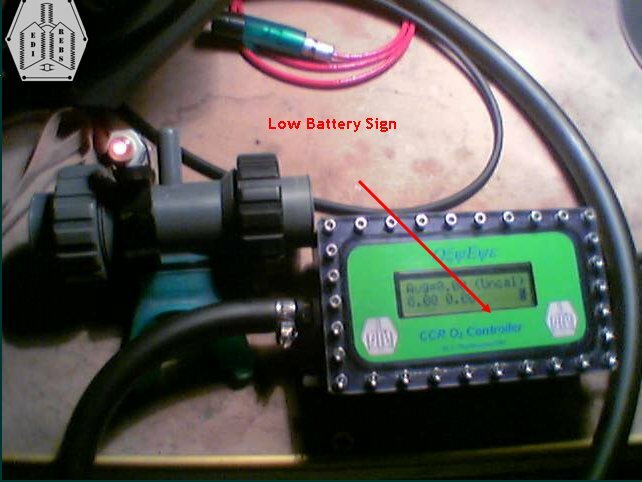 This allow to verify the stability of the reference mix gas in the loop and the goodness of the sensors it selves. Anyway the calibration routine will exclude the sensors with a poor voltage, marking them with the X sign on the right side of top row. Moreover, it will exclude also the unconnected sensors, marking them with the - (dash) sign. The calibrated sensor will be indicated by the * (star) sign. Excluded sensors, of course will not be considered in the average calculation, like shown on fig.4. 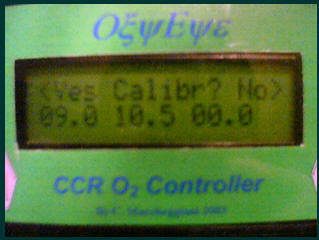 In fig.5 is shown how can you choose the reference gas for calibration, either air or oxygen. It is not possible the casual activation of setup and calibration menus, but is possible, if wanted, to change of PPO2 limits on flight. A serious danger like low PPO2 value will be indicated by a fixed red light, like shown on fig.6. On fig.7 is shown the blinking (!) green light, because PPO2 is over PPO2min, but under Setpoint (PPO2=0.20 ATA). Notice in the dark picture the backlighted LCD. 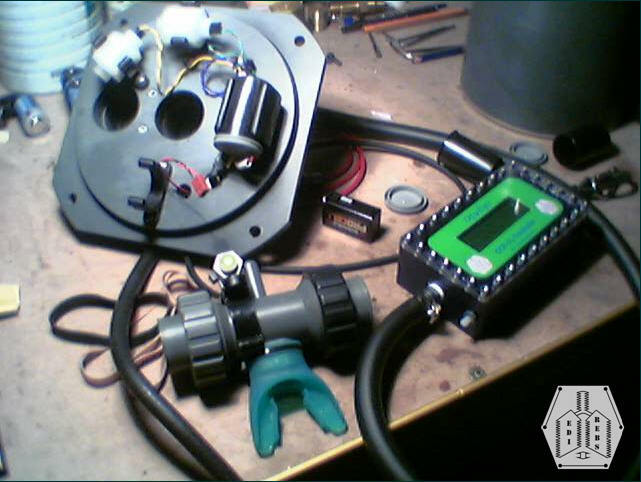 On fig.8 is shown the complete system installed on the head of the EDI2002 Semiclosed Rebreather, where are located the 9 Volts battery and two Teledyne R-22D sensors. The red molex plug connects the third sensor (not installed here) to the HS Eng dive computer. The OxyEye cabinet was built from a block of aluminium with a black anodized treatment and the window is 6 mm thick polycarbonate. The sealing is a 1,7 mm O-ring. In fig.8 is also visible the left pushbutton. Pushbuttons have no through and through holes, but they use two small magnets to activate two golden reed contacts located inside the cabinet due to avoid flooding. The maintenance of the stainless springs and magnets is possible unscrewing the pushbuttons retainers. The cabinet is kept at ambient pressure (this assures a sealing without environmental pressure limit) via the connection hose that contain also the electrical wiring to sensors, battery and LED. The hose is connected to the rebreather body using a passing through G1/4 connector. The LED cable is connected using a PG7 standard passing through connector. Optionally the controller can drive a solenoid oxygen valve to realize an automated PPO2 control. On this case a battery with bigger capacity is required (in eg. 6 x AA 1,5 V). For more info please mail to: carlo.speleo@libero.it or edirebs@libero.it . Carlo, I want to thank you for your efforts putting this report together. I am sure you will get lots of questions. In my opinion it is a nice piece of labor for a most decent price, and the instrument is an important safety factor for KISS and other rebreather divers.